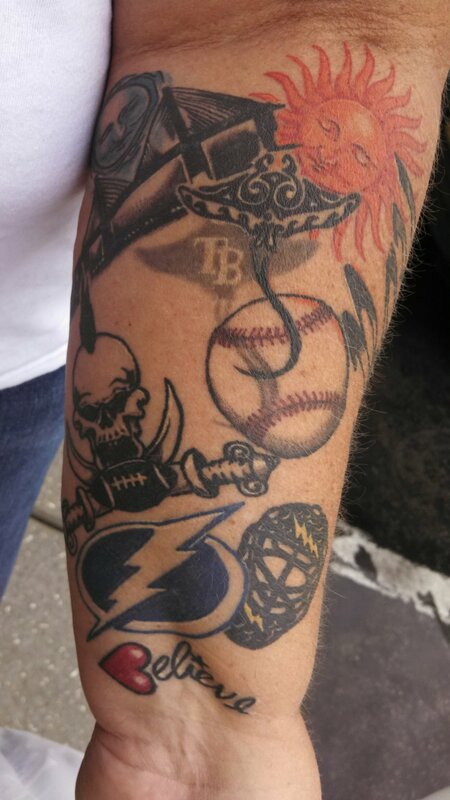 This is without a doubt, the most dedicated Tampa Bays fan ever. Passed by this lady at a Walgreens and saw this tattoo out of the corner of my eye. I had to turn around stop her and asked her if I could take a look at it. Then I asked her if I could take a picture. It features (from the top down) the sun and the moon over the Sunshine Skyway Bridge, the Tampa Bay Rays logo (from the Devil Rays days), a baseball, the Tampa Bay Bucs logo, the Tampa Bay Lightning logo (with a goalie mask), and the inscription “Believe” with the “B” made from a heart. On the other side of her arm in letters large enough to take up that whole side was “Tampa Bay” in beautiful cursive writing. This is OUR kind of gal. We salute you!